If you’re looking for an international study destination where you can learn in English, graduate with a great qualification that attracts employers, stay long-term and be among people who enjoy life to the full, then Ireland may be the perfect place for you. Here are the top 10 reasons to study in Ireland! Some countries won’t let you earn some money on the side as an international student coming from a non-European Economic Area (EEA) country, or will only let you work on campus or with other restrictions on where you may be employed. Not Ireland. Here, you can work 20 hours per week during the academic year and for up to 40 hours per week during designated vacation periods, allowing you to earn as you learn and build up crucial local work experience. So, you’ve moved your life to a new country, obtained a degree or other qualification, and now want to leverage that qualification into an exciting new career where you have already built up contacts and local knowledge. If you go to study in the US, that’s going to be tricky; if you go to the UK, even trickier. Why not come to study in Ireland, which offers the Third Level Graduate Scheme, a stepping stone to long-term settlement? Ireland wants you to learn, earn and stay. There is something for everyone in Irish universities and institutes of technology. If you want to study Law, Medicine, Sciences, Humanities or pretty much anything else, then there are quality courses across a range of Irish institutions offering those courses. Ireland produces and attracts some of the world’s top scholars and professors. Together with a student body that approaches learning with an eagerness not found in many other places, this makes for a unique learning environment. Remember, Ireland is the place where some of the world’s scientific giants such as Robert Boyle and George Stokes brought their ideas and innovation to the fore, and where literary heroes including Wilde and Beckett studied before going on to world fame. 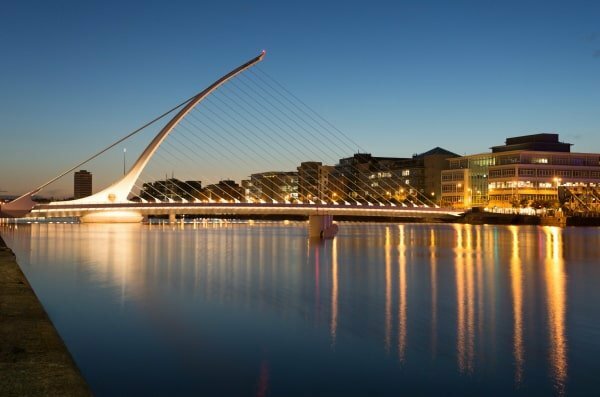 The Samuel Beckett Bridge in Dublin is named after one of the most revered playwrights to ever study in Ireland. Ireland may be an island, but it only an hour or two from continental Europe (aka mainland Europe) by air, and low fares make access easier than ever. (How low are these fares? How does €50 for a return trip sound, or €30, sometimes even €10? Yep, air fares in Europe are often the same price as a good lunch.) So if you want to explore a European city for a weekend or soak up some sun further south, you’re in the perfect place. And for those weekends where you stay in Ireland, don’t worry, there is plenty going on here too. If you are from an EEA country, you won’t need to apply for an Irish study visa. Moreover, you may be eligible for EU fee rates, which makes studying in Ireland more affordable than if you come from a non-EEA country. More information on all of this is available here. (i) Tuition fees in similar institutions in other study destinations, such as the US and Australia, are typically higher than in Ireland. (iii) Remember, you can earn while studying and stay in Ireland upon graduation (see the first two reasons to study in Ireland near the top of this page). Thinking about studying in Ireland? You may leave Ireland one day (though we think you’ll be tempted to stay), but no matter where you end up, know this: if you have a qualification from an Irish university or institute of technology, employers will be impressed. Don’t ask us, ask The Economist magazine, which recently found that graduates from Irish institutions can expect greater lifetime earnings than those who graduated anywhere else in the OECD. Ireland is soon likely to be the only predominantly English-speaking country in the EU. Knowledge of education through English, the international language of business, politics, science and aviation, is generally considered to be one the most valuable skills a graduate can possess. Though other European study destinations and their institutions offer courses fully or partly through English, in Ireland you’ll get to study and live through English. Which brings us neatly on to . . . So, you’ve come to study in Ireland but want more than just that. Fortunately, Irish people know when and how to relax. International students often come to Ireland for any of the nine reasons outlined above, only to be blown away by how much fun they end up having. Here you will be invited to events, shows, shindigs and more, and like many international students who came before, you’ll end up telling others back home that it’s really the people who make Ireland what it is.